For some, gathering audiences for “standard” communication activities such as publications or events is a big enough challenge in itself. We can only dream of getting the word out about ENI CBC on television….right? Wrong. The Latvia-Lithuania-Belarus Programme has breached a new frontier in this regard for their European Cooperation Day (EC Day) activity this year. 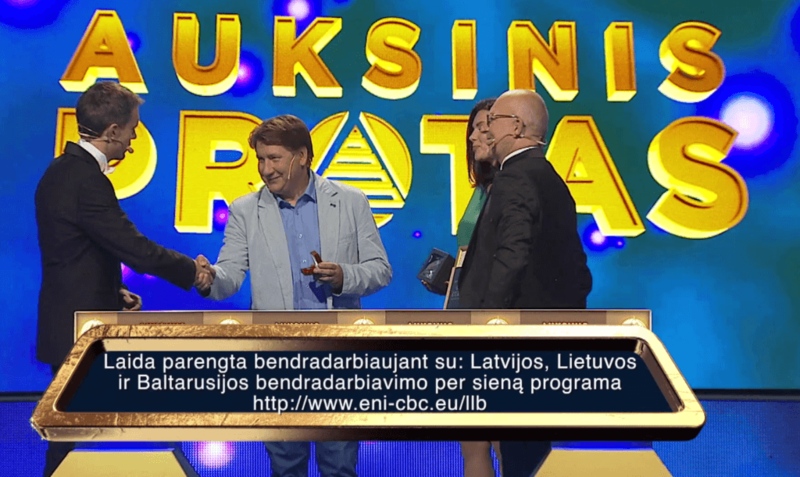 We talked to them to find out just how they managed to get the programme some publicity on Lithuanian national television. 1. Please introduce yourself and your role to our readers. I’m Valerija Machnorylova, a Senior Communication Manager of the Latvia-Lithuania-Belarus Programme. In the past, I have worked with a couple of other CBC programmes and contributed to organising the EC Day events from the very beginning in 2012. 2. Congratulations on the innovative EC Day event! Could you tell us how the idea came about for this? 3. Could you explain a bit to our readers what the television show is about, who watches it and what is the main target group? ‘The Golden Mind’ unites representatives of various layers of society in an entertaining, adventurous and exciting activity. TV viewers love the show for the great variety of questions posed to six participants weekly and whole families gather every Wednesday by the TV to witness yet another amazing intellectual fight. The show is led by the top famous Lithuanian hosts: Arūnas Valinskas and Andrius Tapinas. 4. The programme on 20th September was dedicated to European Cooperation Day. What exactly did that involve during the programme? First of all, the hosts presented what European Cooperation Day is and what the CBC programmes do. Secondly, the participants of the show were very unexpected for the viewers: four mayors from the border regions and two representatives of youth communities in Latvia and Poland. Lastly, the majorify of the show questions were focused on CBC and neighbouring countries. 5. How was the Latvia-Lithuania-Belarus CBC Programme showcased by the programme? What was the added value for your programme? The programme and its activities was presented to the viewers and they had the chance to learn a lot about our closest neighbouring countries. 6. Do you have any facts and figures from viewers and people reached? The show was viewed by around 300 000 viewers over the age of four, which means that every 10th resident of Lithuania watched it. 7. What was the biggest challenge in organising such an event? What was the most rewarding element of organising such an event? The biggest challenge was to follow the strict requirements of the national television and to adapt the show so that it fulfils our vision on how the European Cooperation Day edition should look like. We managed to introduce quite a number of unusual elements into the show and are happy with the results. For example, this was the only show, where several questions were asked not only by the hosts themselves, but also by the guru of regional policy – the Vice-Minister of the Interior, Giedrius Surplys. 8. Do you have any advice for other programmes on getting inspiration for creative events? The main advice would be to be not afraid of trying something new and to believe in yourself. Almost no-one believed that we could implement our idea, but when you truly have faith in something, there are high chances it might work. And we could not agree with you more! It is not always easy to try something new in communications for the first time but with some planning and courage, positive results and spreading the CBC word can be achieved. Once again, congratulations to the Latvia-Lithuania-Belarus Programme and thanks for sharing your experience with us.